Opening in June, Encore Boston Harbor will have 4000 gaming positions, 671 hotel rooms, 15 restaurants, and an estimated 8 million visitors per year. The Massachusetts Gaming Commission (MGC) issued a 209-page report on Wynn Resorts’ executives, claiming they covered up the sexual harassment and misconduct scandals of company founder Steve Wynn. The report described a company culture in which workers were afraid to file complaints. According to MGC investigators, many employees felt it was pointless to speak up about misconduct. In such a work environment, Steve Wynn’s behavior went unchecked for years until the January 2018 Wall Street Journal expose that brought the quick downfall of the 77-year old company founder and chief executive. Investigators focused more on Wynn Resorts’ board of directors than it did the allegations against Steve Wynn. Their document is a scatching indictment of Wynn’s board members from 2005 to 2018, most of whom are no longer with the company. Wynn’s outside lawyers receive special condemnation. In some cases, board members approved multi-million dollar payments to pay settlements — which made it next-to-impossible to deny the board did not know of the worst accusations against Steve Wynn. If anything, the Masssachusetts Gaming Commission‘s report is more critical than the Nevada Gaming Commission’s report two months ago on the same issue. Nevada regulators eventually fined Wynn Resorts $20 million for its roll in hiding Steve Wynn’s alleged actions — more than three times the previous record fine in Nevada gaming. Whether Massachusetts officials take the same path is another matter. At stake is Wynn Resorts’ casino license for Encore Boston Harbor, an integrated resort which cost between $2.4 billion and $2.5 billion to build. Development of the casino created thousands of temporary jobs in construction, while it offers up to 4,500 permanent jobs for the Boston area. Everett Mayor Carlo DeMaria have given vocal support to Wynn Resorts. 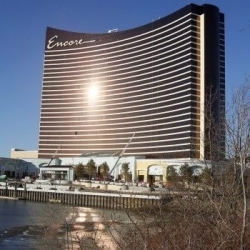 Mayor DeMaria even stated he would veto a sale of Encore Boston Harbor to Mohegan Sun, one of Wynn Resorts’ rivals in the licensing process. Everett’s leaders have the right to veto any such deals, which could complicate an attempt by Massachusetts officials to force a sale to a casino company without ethical concerns. Wynn Resorts’ CEO Matthew Maddox’s strategy is to argue that the regulators’ report criticizes former Wynn board members and those directors have been replaced. Maddox suggests that the people at fault have been purged and a new generation of executives run the company now. That is what makes the accuasations about the Wynn Resorts legal team interesting. It might be that the top management and board of directors has been purged, but the legal department or the team of outside lawyers remains the same. Also, it complicates matters for Matt Maddox that he is the last remaining executive who sat on the board in the Steve Wynn era. With Encore Boston Harbor expected to open in June, time is running late for the Massachusetts Gaming Commission to strip its license from Wynn. It could happen, but the easy way out would be for the Gaming Commission to fine Wynn Resorts a huge amount and claim the corporate culture has changed. Whether that would be enough in the current environment is another matter.